It's been a great summer at Oda May's camp over on the Moda Bake Shop blog. Closing Ceremonies for camp was a few days ago and I'm happy to say I'm leaving camp with a completed quilt top. But now the big question is - How do I quilt it? 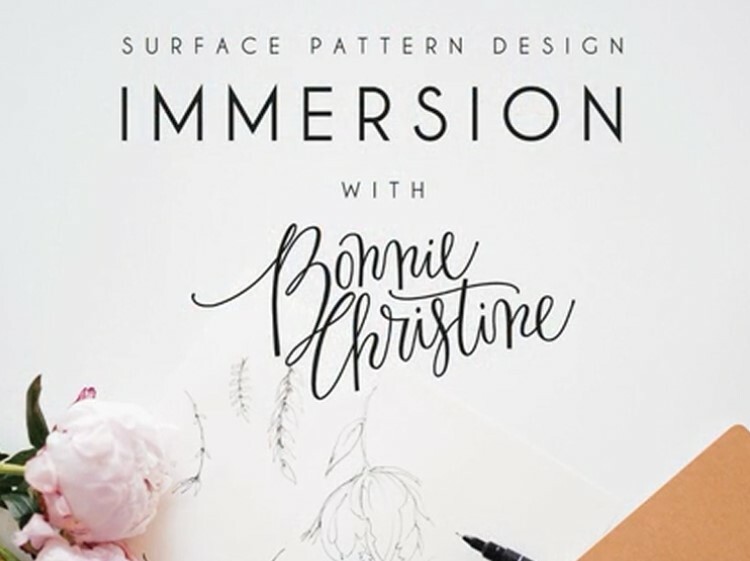 My first thought was just to quilt an Edge 2 Edge design because I really need to get back to my surface pattern designs if I am to meet my self-imposed deadlines this fall. But, then I think this quilt would be the perfect quilt for some custom quilting. But then again, are the fabrics too busy and would the quilting not show up anyway? So many questions and indecisions, what's a girl to do? So, I'm looking for suggestions from all of you! 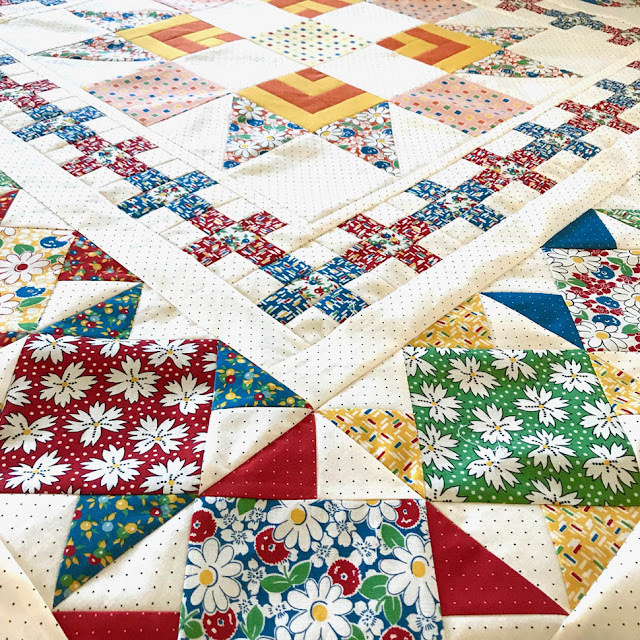 Should I quilt an E2E or custom? What patterns would you use (I'm not a free-hander) in the different blocks and borders? 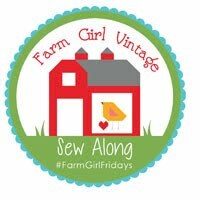 HELP, I'm sending out a distress signal to all my quilty friends and followers! 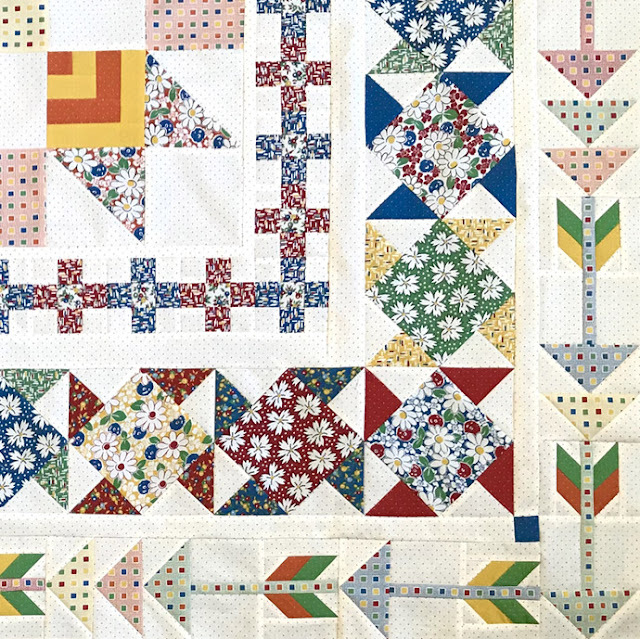 I did see that HollyAnne on the String & Story blog is going to do a series of blog posts on how to free motion quilt the Choose Your Own Adventure quilt, so I'll be interested to see what she does. But, she will be doing it over several weeks and I really don't have time to drag it out that long. Anyway, hit me up with some ideas! The end is here. 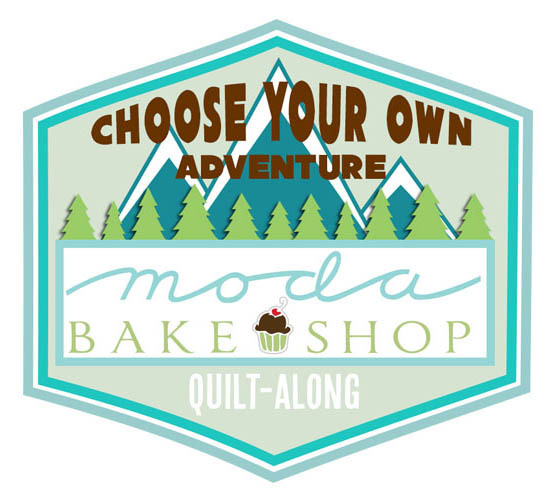 The final closing ceremonies for the Choose Your Own Adventure QAL on Moda Bake Shop was posted this morning. 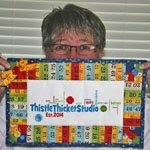 I'm a little sad that summer camp has ended but excited as I sit here in my sewing room sewing on my last border. 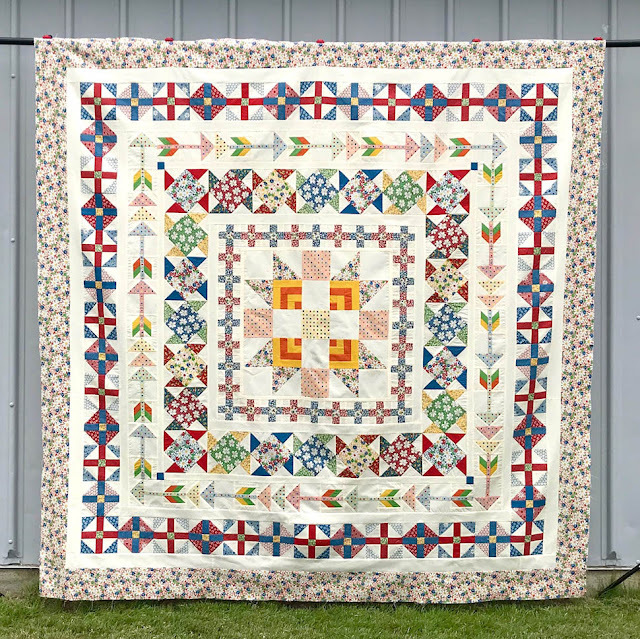 This quilt has sure been an adventure! 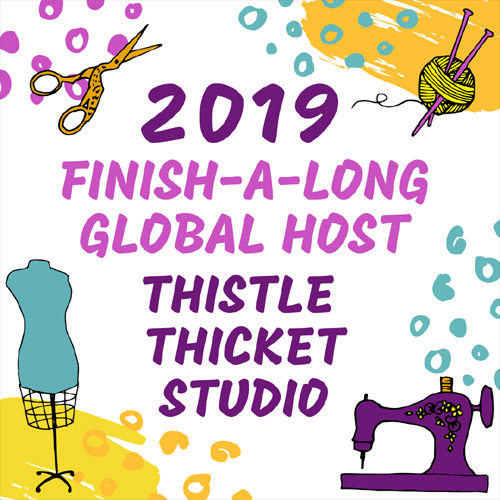 With the closing ceremonies, I am happy to share my final contribution as a co-host of this QAL - the Piney Woods Quilt Label. 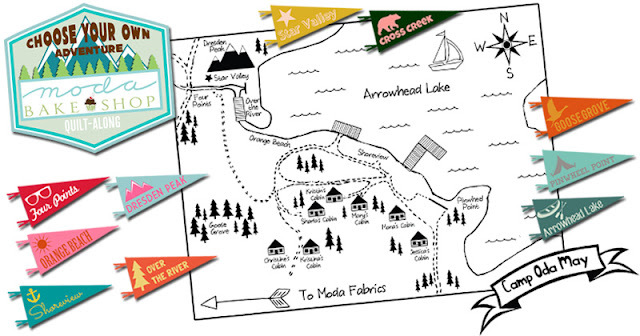 I designed this quilt label as the perfect way to commemorate the adventures that each participant enjoyed while at Oda May's Summer Camp. I hope everyone who attended summer camp enjoyed it as much as I did! Stay tuned and I'll be sharing my completed quilt top in a day or two. P.S. Oh, I almost forgot!!! 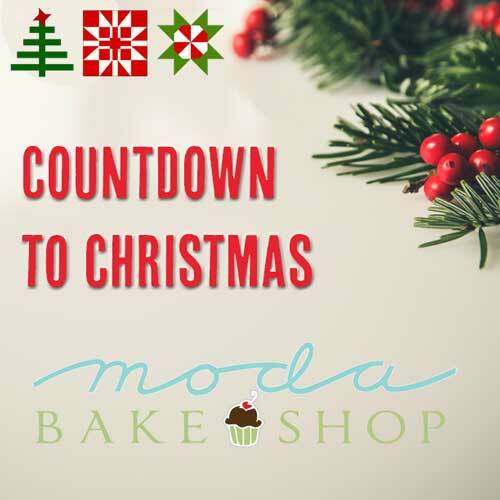 Moda Bake Shop is sponsoring a giveaway on today's Closing Ceremonies blog post so be sure to visit the site - link here - and comment for a chance to win! Oh wow, I am sooo behind! 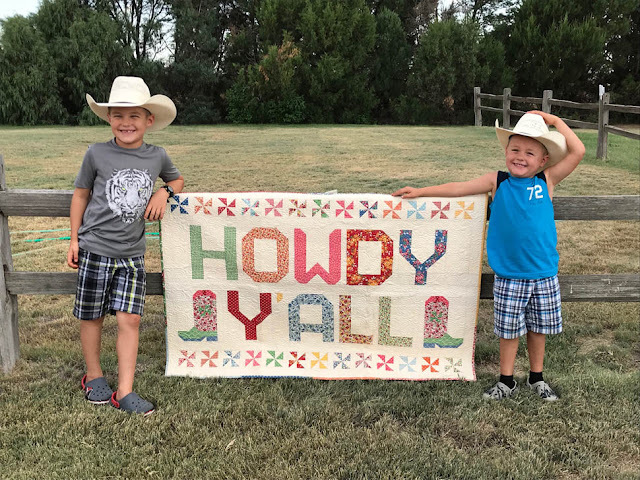 I had family come visit me at camp last week and so I put my sewing adventures aside as we enjoyed our local county fair with the kids and grandkids. But while I'm still trying to finish the last pieced border at Oda May's Summer Camp, Oda has moved right on past me and has posted the last borders today. 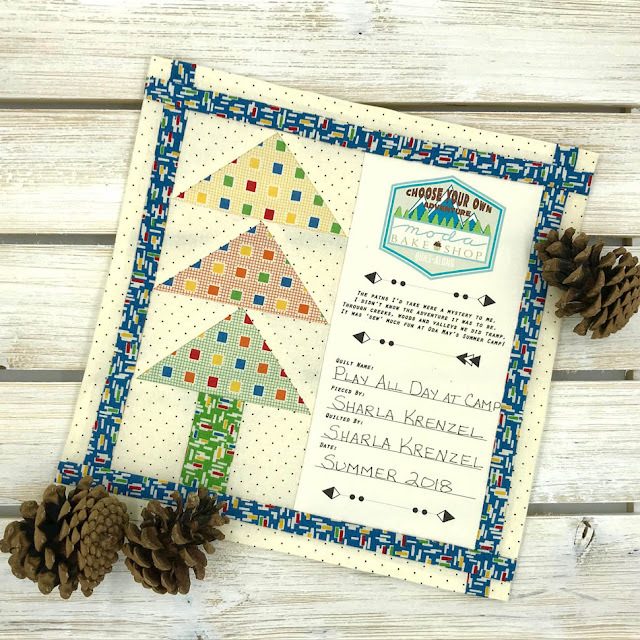 Can you believe our time has come to an end for the Choose Your Own Adventure QAL? I chose Path B for the last pieced border and hiked with Jessica Dayon of Skein and Hook to Shoreview and dipped my toes in the water. I chose this block as it reflects the crosses in my first pieced border, kind of like a reflection in the pond at camp. 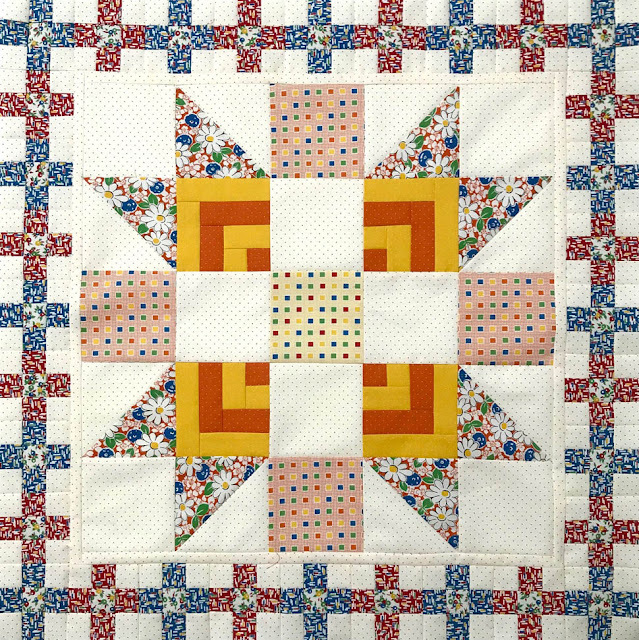 Click here for instructions for the Shoreview block. Here's the cutting chart from EQ7. There is a total of 48 - 5" blocks, 24 red crosses with blue corners and 24 blue crosses with red corners. The cutting chart is for one of each, so multiply those pieces by 24. 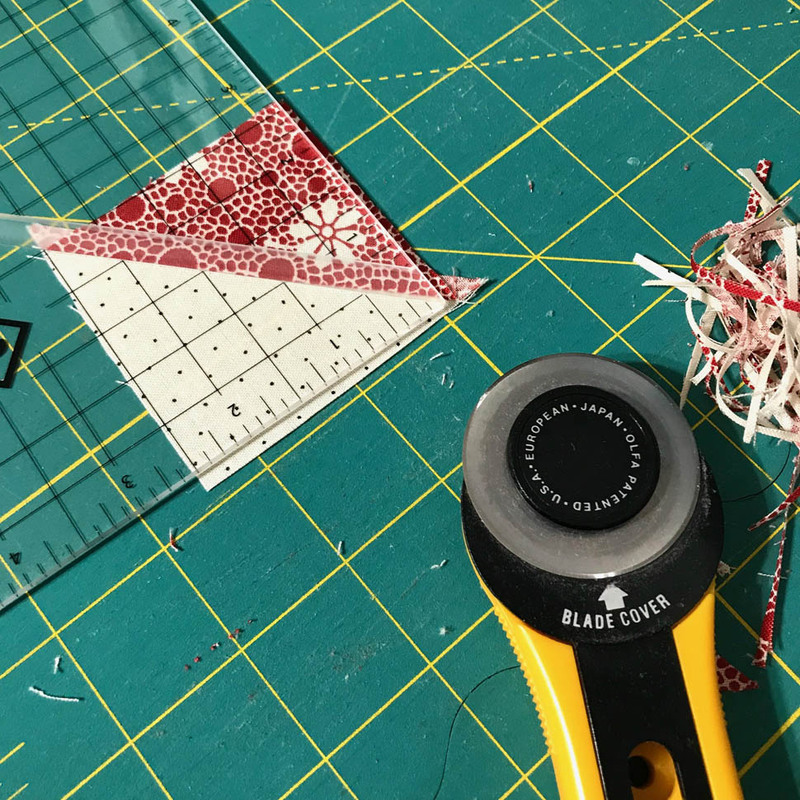 I rounded up the half square triangle squares to 3" then squared them up to 2 1/2" after they were sewn using my Bloc-Loc ruler. Much easier than cutting 2 7/8" squares! 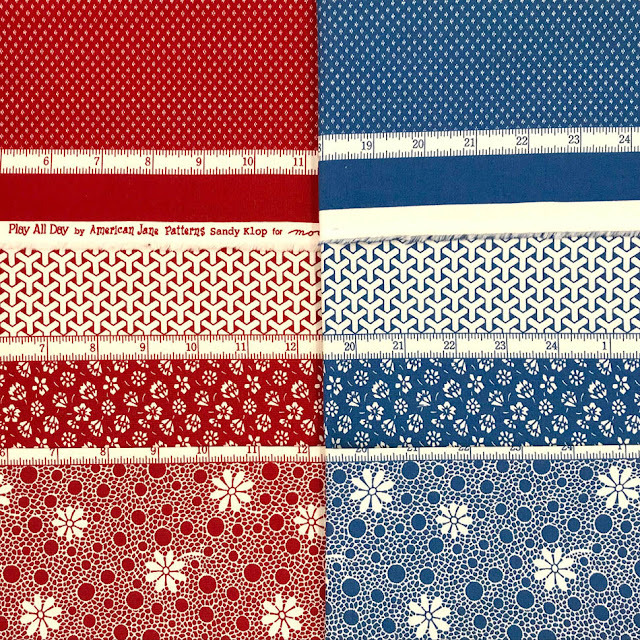 I was excited to try out the 4-in-1 yardage that is a part of the Play All Day collection by American Jane for Moda. 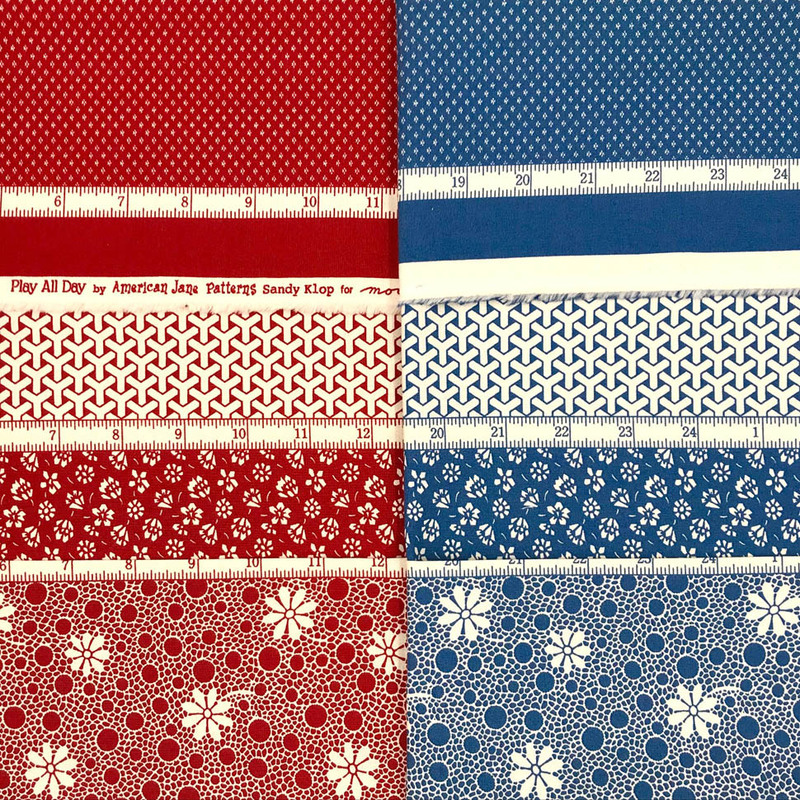 The yardage is broken down into 4 sections of prints with a cute tape measure dividing each section. I cut the tape measure segments out and will use them in some future project. 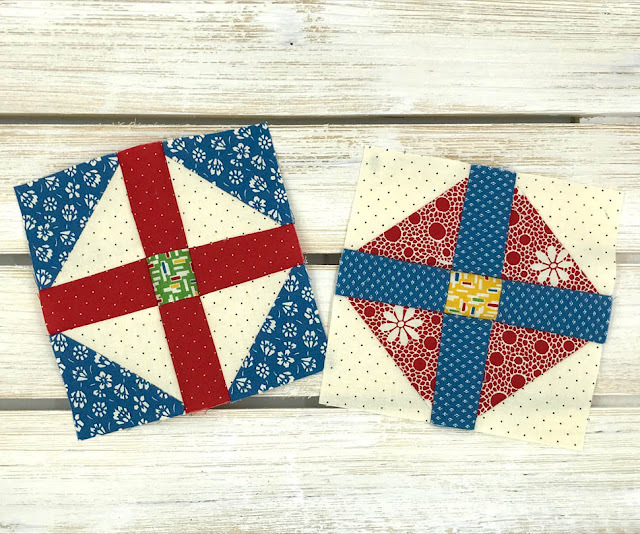 Here are the two blocks for this pieced border. I'm still working on these blocks so I don't have them sewn to my quilt yet. I'm hoping to have my top finished by Monday when Summer Camp Closing Ceremonies are posted. Be sure to tune in, I designed a little surprise for that post and Moda Bake Shop is hosting a giveaway too! Until then campers, keep trekking! P.S. Just a few photos of why I'm behind on sewing at camp - a Nana has to share a little, right? Welcoming my little Texans to our farm. What a fashion statement - plaid shorts, crocs and cowboy hats! 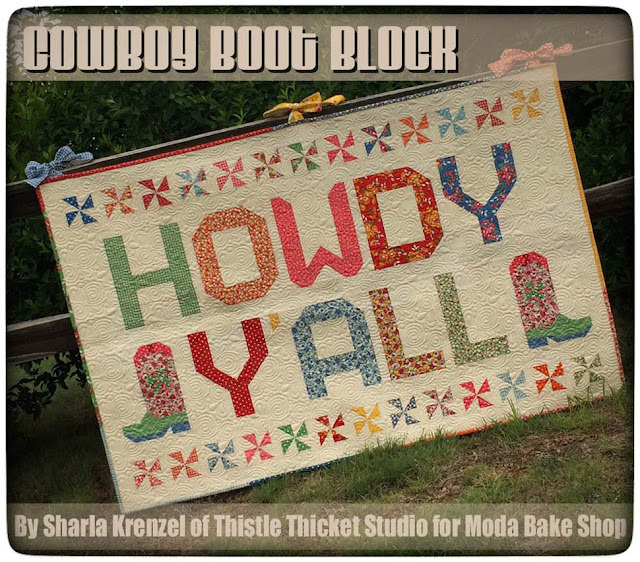 I made this quilt for Moda Bake Shop's Spell It With Moda. You can find the instructions here. My daughter and grandson #1 on the ferris wheel. 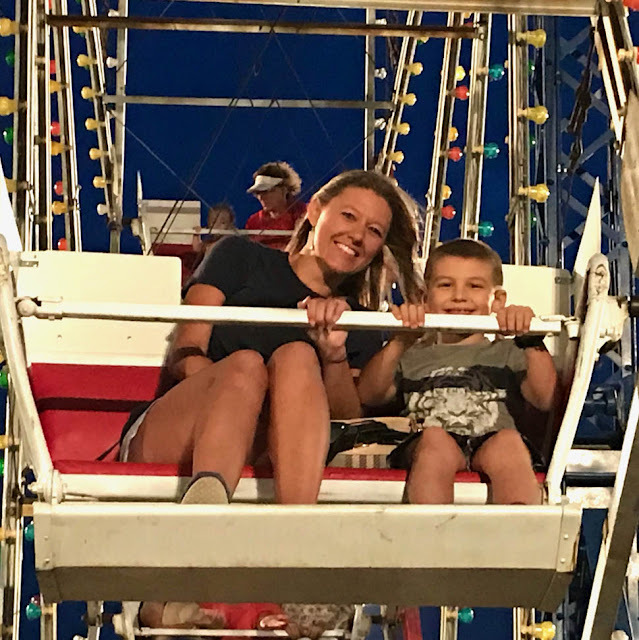 Our community owns our own carnival and all the rides and games are 25 cents! It's such a special time with family and friends! 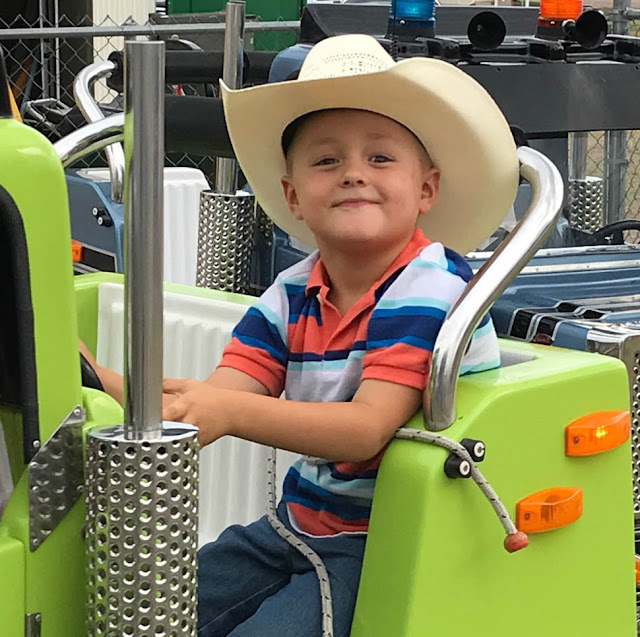 Our little goofball, Grandson #2, riding the fire trucks. He had a blast riding all the kiddie rides while Grandson #1 enjoyed the games more.